I made a batch of butternut squash soup to freeze earlier this week and I can't wait to eat it later this fall and during the winter. The best part about it is that it's so easy to make! Cut the squash in half lengthwise and roast at 350 degrees for 30-40 minutes, or until a knife is easily inserted into the skin. Once the squash is soft, scoop out the seeds and discard then scoop the flesh into a bowl and discard the skin. Dice the onion and saute in a medium sauce pan with olive oil until soft then add chicken broth, squash, salt, pepper and nutmeg. Puree with an immersion blender and heat through. Told ya it was easy peasy! 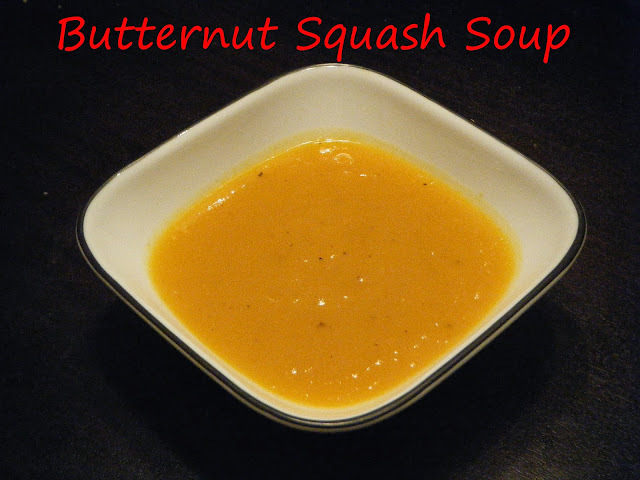 we just ate a butternut squash dish tonight! I'm sharing the recipe tomorrow at the mommybloghoppers blog! I only like it in soup form. But, it's so good that way! Oh so exciting! I have never had this before but I bet it is amazing! I am going to make it this week so I can try it, finally. Thanks for the recipe.